I'm a big fan of God of War, the game, the art and the Norse mythology. It's one thing to read about Norse gods and their stories, but it's something else entirely to experience the stories visually, to see characters come to life, even if the stories are stretched far from the original source. What I like about the whole God of War game series is the epic-ness it delivers. This 224-page hardcover companion video game art book is a must-buy for fans of the game and just about anyone who collects such concept art books. The book is packed with stunning artworks. The character designs are wonderful. You'll get to see different versions of Kratos, his armor and amazingly detailed hand-sculpted maquettes (that I initially had mistaken for 3D renders). There's his son too, of course, and plenty of other characters, enemies and creatures. The designs look so good. Sooooo good. My favourites are the scene and environment art. There's so much depth, details and mystique in the landscapes. The artworks are really beautifully created, not like some rough speed-paintover job. The landscape is harsh and the characters that live there reflects the harshness. This artbook is definitely one of 2018's top artbooks. It's you can admire slowly at every page. Most highly recommended. 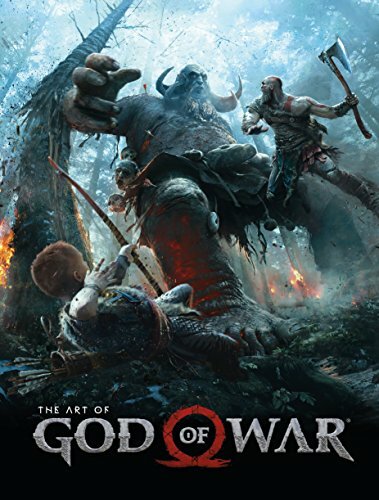 Be sure to check out earlier GoW artbooks too.